Uses :- Velcade (bortezomib) injection interferes with the growth of some cancer cells and keeps them from spreading in your body. 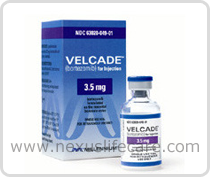 Velcade Injection is used to treat multiple myeloma and mantle cell lymphoma. It is sometimes given after other cancer medications have been tried without successful treatment. Side Effects:- Dizziness, lightheadedness, nausea, vomiting, loss of appetite, diarrhea, constipation, tiredness, weakness, blurred vision, or pain/redness at injection site may occur. If any of these effects persist or worsen, notify your doctor or pharmacist promptly. Remember that your doctor has prescribed this medication because he or she has judged that the benefit to you is greater than the risk of side effects. Many people using this medication do not have serious side effects.